Yesterday I ran into issues upgrading my developer box from 9.3 SP1 to 9.3.1. I’m running Windows Server 2008. No problems upgrading ArcGIS Desktop. However, after completing the post install of server I was no longer able to browse to my local services via http://localhost/arcgis/rest/services. In fact, my entire ArcGIS instance folder located under wwwroot was gone! 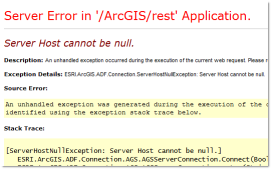 So I uninstalled ArcGIS Server completely and reinstalled ArcGIS Server 9.3. This time the instance folder was created, but inside the rest folder, the rest.config file did not contain my server information. Instead all those fields were empty, explaining the “Server Host cannot be null” error received when trying to browse to the services directory. Remove the arcsom, arcsoc, and arcwebservices users from both agsadmin and agsusers groups created during post install. DO NOT delete those groups! Server 9.3 to 9.3.1 � jeff germain�s blog”. Will you care in cases where I actuallymake use of a bit of of your suggestions?